WrestleMania 34 (and the surrounding post-Mania episodes of Monday Night RAW and SmackDown Live!) are in the books, and more change is coming to WWE: the annual Superstar Shake-Up, which begins next Monday night. Last year's Shake-Up made quite a bit of impact, as it brought The Miz, Dean Ambrose, and Alexa Bliss (among others) to Raw and The New Day, Charlotte, and Jinder Mahal (among others) to SmackDown, giving Mahal at least an opportunity he parlayed into reigns as both WWE Champion and United States Champion within the next 365 days. Who will get those chances this year? Surely some big names will change brands, and we've taken one male Superstar, one female Superstar, and one tag team from each roster and singled them out as the group that might most benefit from changing brands in the pending Superstar Shakeup. Poor Cass didn't really get a chance to get going as a solo act before tearing his ACL last August, and when he is ready to return to action, he'd be returning to a RAW roster that's full of hosses. On SmackDown, though, he'd literally be a big fish in a pond full of smaller (comparatively) Superstars, and given that you can't spell "blue brand" without a solid "B," less pressure may help Cass find his footing as both a heel and a singles wrestler. Look at the tag teams on the RAW roster as of the end of WrestleMania week, and then look at the group on SmackDown. There's one on each side that stands out as being different from the others; the difference between those two teams, though, is that The Bludgeon Brothers are the SmackDown Tag Team Champions, while The Revival were in the Andre the Giant Memorial Battle Royal and then lost to a makeshift Matt Hardy/Bray Wyatt combo the next night. If anyone could benefit from working with teams like The New Day, The Usos, and Breezango every week, it's Dash & Dawson. With Paige officially retired and just named as the new General Manager of SmackDown, now would seem to be a perfect time to let the other two members of Absolution go their own way, as well. That would have to mean one (or both) getting sent to the blue brand, and with Sonya Deville easily the more "ready for prime time" of the two, Mandy could fit right in on SmackDown - perhaps as a pal of Carmella, or even as a foil for her former mentor? Dolph has been an afterthought since returning to SmackDown at the Royal Rumble, but right now, he could easily jump smack dab into the middle of the current Intercontinental Championship storyline on Raw: the one surrounding the Intercontinental Championship. 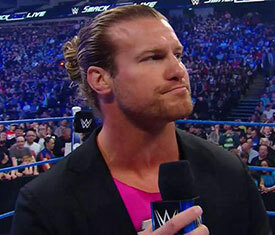 In the ring, Ziggler could steal the show with any one of Seth Rollins, Finn Balor, Jeff Hardy, or The Miz, and his history with the latter makes him a perfect foil for Miz, who is one reign away from tying Chris Jericho's nine for most ever and also about three weeks as champion shy of passing Pedro Morales for most days reigned as I-C Champ. There are actually one-and-a-half tag teams on the blue brand that stick out, and it's half because outside of being part of The Fashion Files, most people don't even remember The Ascension are on SmackDown. They may need a fresher start more than anyone, and at the very least, the role of "bottom-card heel team" is a step up from "bottom-card face team's sidekicks." Charlotte Flair is the SmackDown Women's Champion, with no shortage of heel challengers, Naomi just won the WrestleMania Women's Battle Royal, and Asuka may or may not officially be a SmackDown Superstar for now. So where does that leave Becky Lynch on the depth chart? A lot lower than she would be on RAW, where she could also renew rivalries with Mickie James, Alexa Bliss, and perhaps even the other two of WWE's Four Horsewomen, if and when they resolve their own issue.